The Bookstore Plus Hosts L.R. Smolarek For a Book Signing! The Bookstore Plus is excited to welcome back Linda Smolarek for a signing event on Sunday, August 4th, 2019, from 1:00 to 3:00 PM. Get your copies of Adirondack Audacity", "Audacity On The Water" and her newest release, "Audacity of an Adirondack Summer" signed! In addition to her three romance books Linda is releasing a new young adult series ( The Forest Keepers of the Adirondacks-4th grade through 7th). The first book is called Narvadack about an 11 year old girl who goes to camp after the death of her mother and finds a family mystery and magic in the Adirondack Mountains. It starts with balsam-scented forests, hiking or paddling a quiet stream…it’s an Adirondack state of mind. But not so for Ellen McCauley Rienz, armed with a summer checklist, she has a wedding to plan and all 46 Adirondack High Peaks to hike…by Labor Day. Unfortunately, life has a way of interfering with even the best of plans. Something strange is going on at Camp, threatening letters, uninvited neighbors showing up at the most inconvenient times and ghostly apparitions. Add a few mysterious trespassers camping on the lake with glow-in-the dark hula-hoops and summer holds more surprises then Ellen anticipated. When her husband, Vic returns from an extended work trip…different, very different, Ellen is perplexed. Undaunted by the troublesome irritations, she forges on and learns hiking the High Peaks, while rewarding…is really hard. And sometimes resentments, forgotten and thought long buried have a way of resurrecting themselves. Award winning author, L.R. 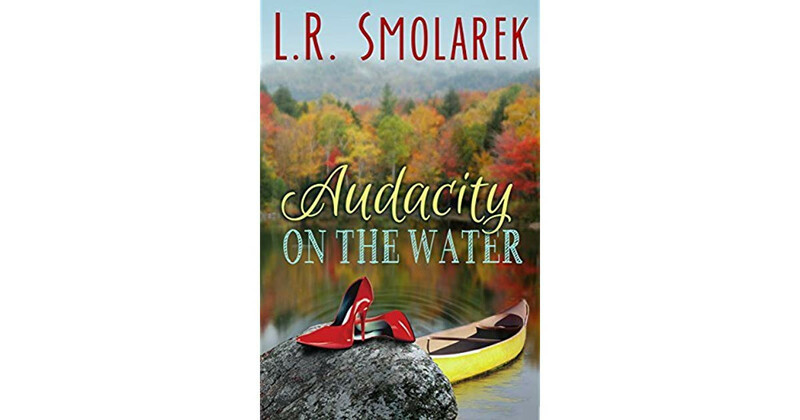 Smolarek brings love, laughter, mystery and a hint of sizzle to the splendor of the Adirondack Mountains. Audacity of An Adirondack Summer is the perfect pairing with a glass of chardonnay and an Adirondack chair.